Worthing Pier named Pier Of The Year 2019! 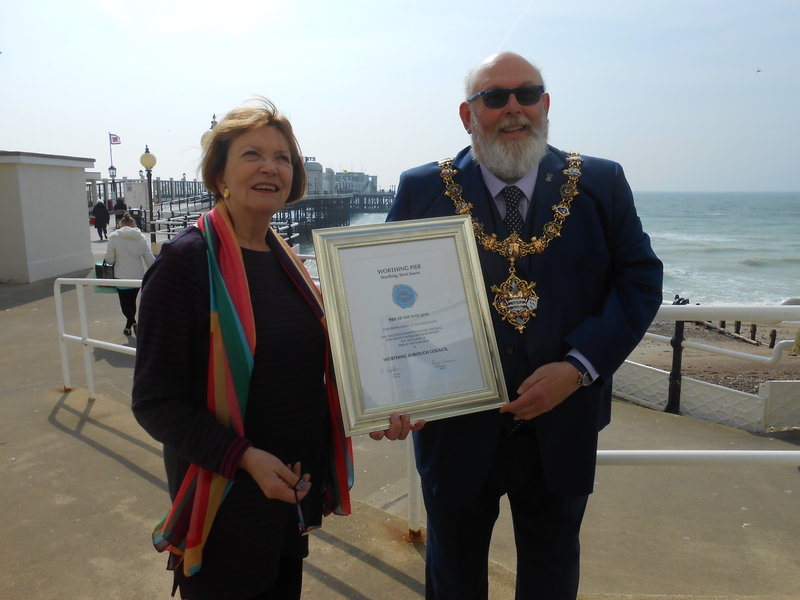 On Monday 15th April, National Piers Society Patron, Dame Joan Bakewell, awarded the Pier Of The Year Certificate to Councillor Paul Baker, Mayor of Worthing. Worthing Pier opened on 12th April 1862. It was designed purely as a landing stage but in 1889 a Pavilion was erected on the pier head. In March 1913, however, a storm severed it from the pier. The gap was soon restored and the pier reopened in May 1914. In 1920 it was sold to the Worthing Corporation. A shoreward Pavilion opened in 1926 and became home to the Worthing Municipal Orchestra. The building at the pier head was renamed the Southern Pavilion but in September 1933 it went up in flames. It was replaced in record time at a cost of £18,000 and reopened in August 1935. Two years later a matching Modernist style amusement arcade was added and a central windbreak was installed along the pier’s length. At the outbreak of World War II the steamers stopped calling and in 1940 the pier was deliberately cut in half. The entrance Pavilion was taken over by troops who enjoyed snooker, table tennis and darts there as well as a canteen and a library. It reopened to the public in June 1946 and shows such as The Fol de Rols were engaged for the summer season. The Denton Lounge was added in 1959. After the Worthing Municipal Orchestra disbanded the Southern Pavilion was put to various uses including a model railway museum, a cinema and a zoo. In the 1980s it became a night club but this closed in 2005 and the building lay empty until Phil Duckett, a local businessman, completely restored it. It is now an elegant eating place as well as a performance area and wedding and conference venue. The Mayor of Worthing, Councillor Paul Baker, said “I’m delighted the National Piers Society has recognized once more what a fantastic pier we have; it really is an iconic landmark for the town”. For further information please contact Anthony Wills, National Piers Society Media Relations Officer, tel. 07912 039079 email awpiers@gmail.com or Mike Gilson, Head of Communications, Adur & Worthing Councils, tel. 07909 688132.